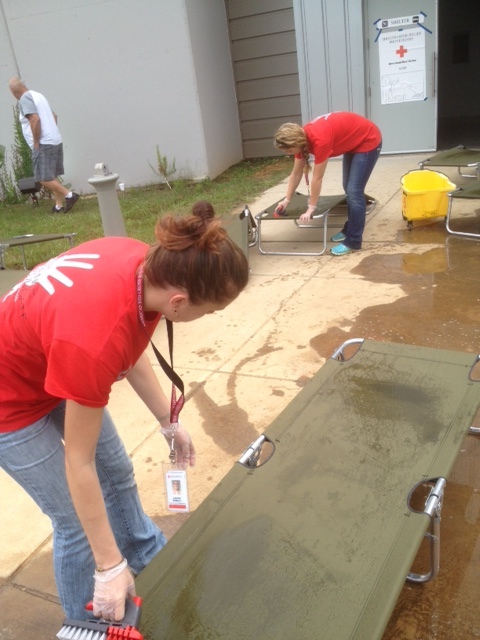 Americorp and Red Cross volunteers man a modern emergency shelter for displaced victims of hurricane Issac. As the flood waters recede back to the overflowed branches and creeks, shelter residents have been returning to their homes to pick up their daily routines. Americorp volunteers Kirstin Heininger, and Lauren Watson along with Red Cross volunteer Samuel Allen and Mike Mahn dismantle sleeping quarters and prepare equipment for storage. This shelter won’t close until the last displaced person has been able to find alternative living arrangements. When that happens most likely the Americorp and Red Cross volunteers will move on to support shelter efforts in other flood impacted areas.